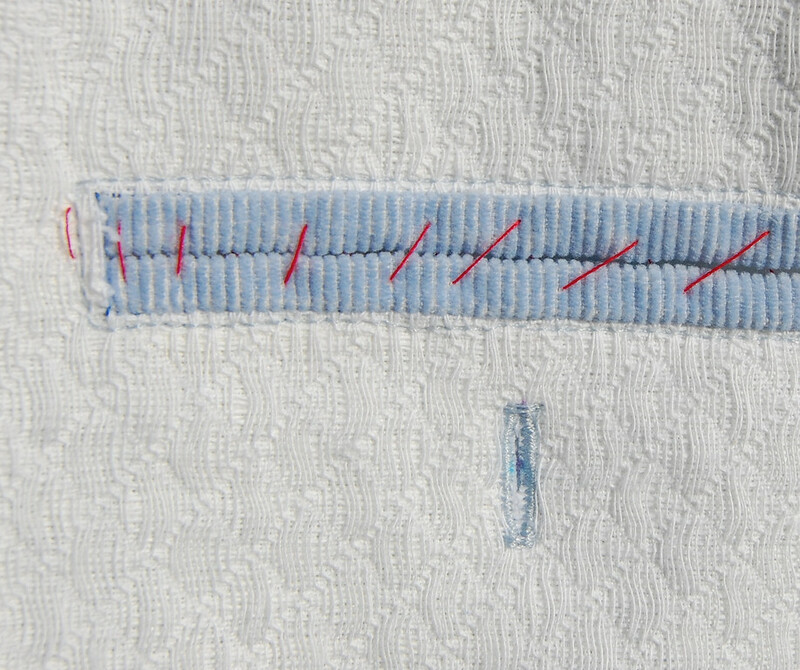 Today's double bound welt pocket is very similar in construction to bound buttonholes. This fact alone might explain why Mum referred to them (and welt pockets in general) as buttonhole pockets. 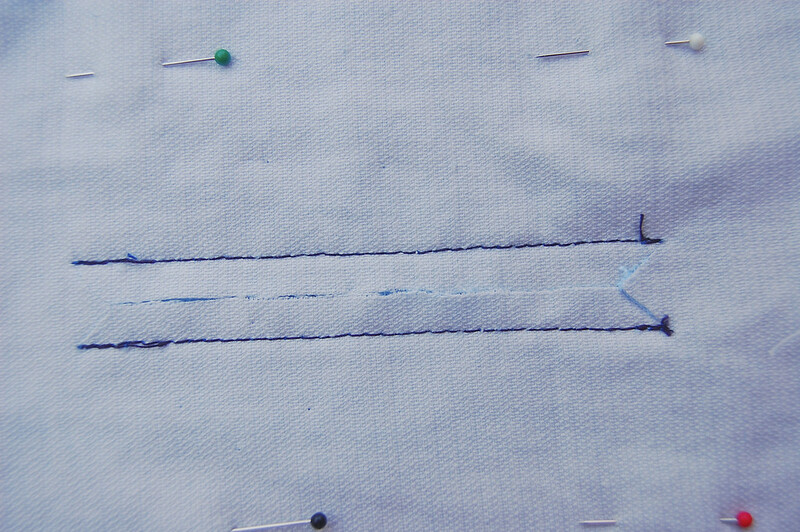 Again, I am going to use the same shortcut method of making them as with the single bound welt pockets. I will make them again two posts later, using the more er... formal method. 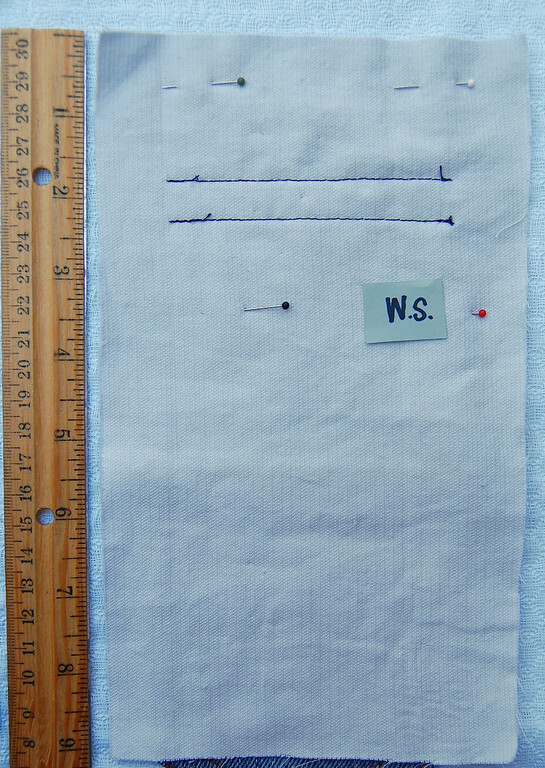 Length = 2 x (final depth of pocket pouch + width of welt opening) + seam allowance. All will be clear in the later steps. 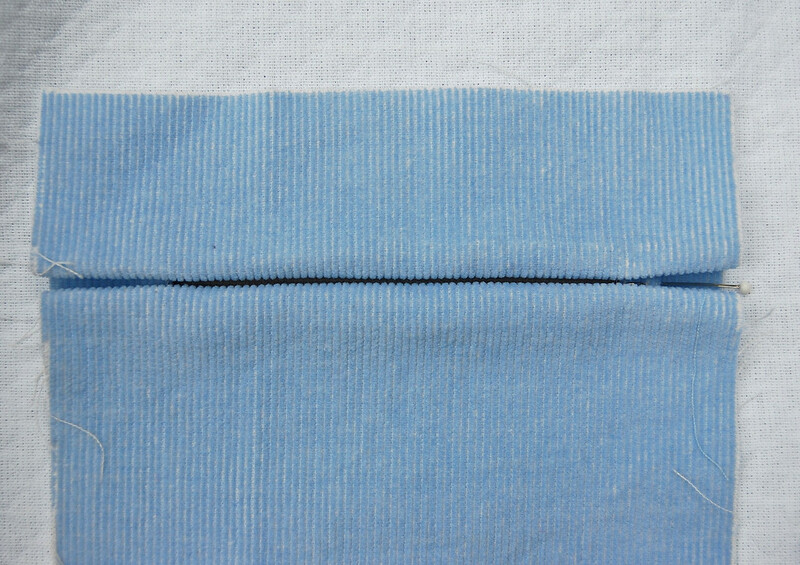 The first 3 steps are identical to that of the single bound welt pocket, so I'll just repeat the instructions. For more detailed instructions and photos on making the basic welt opening, see the earlier post here. 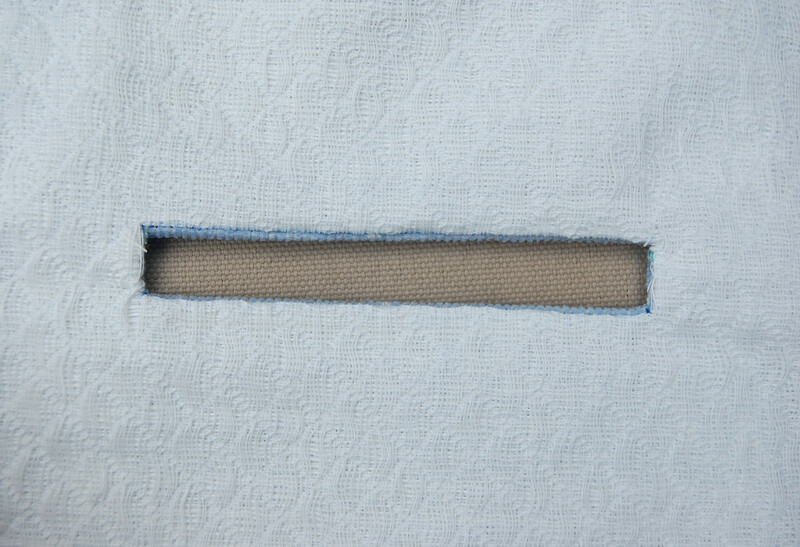 Mark on the right side of your garment fabric, the position of the welt opening. 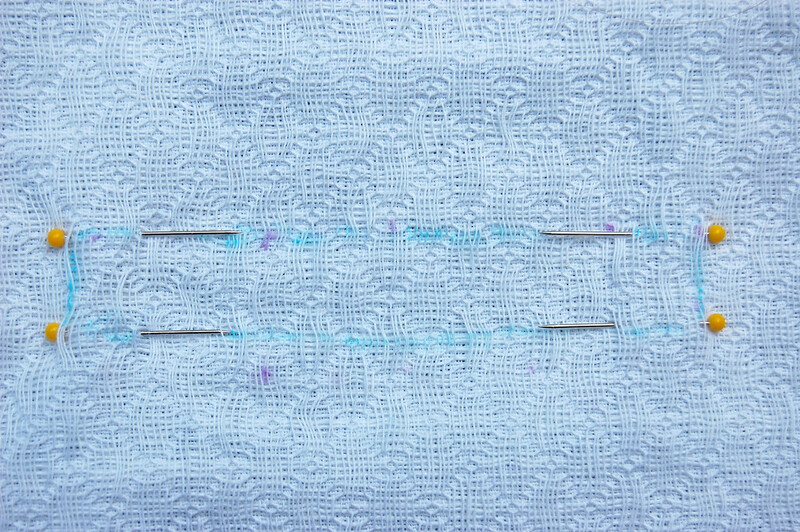 Transfer the lines to the wrong side of the garment fabric. I use pins to help mark the positions of the corners. it is centered sideways over the pocket opening. Flip to the wrong side of the garment fabric and sew the top and bottom edges of the welt opening. Remember to make them exactly the same length. and turn the lining/facing/lips fabric piece right side out through the opening. For variety in the sequence, let's sew the little triangles down at this point in the process. Flip to the wrong side of the garment - here is the welt opening seen from the back. 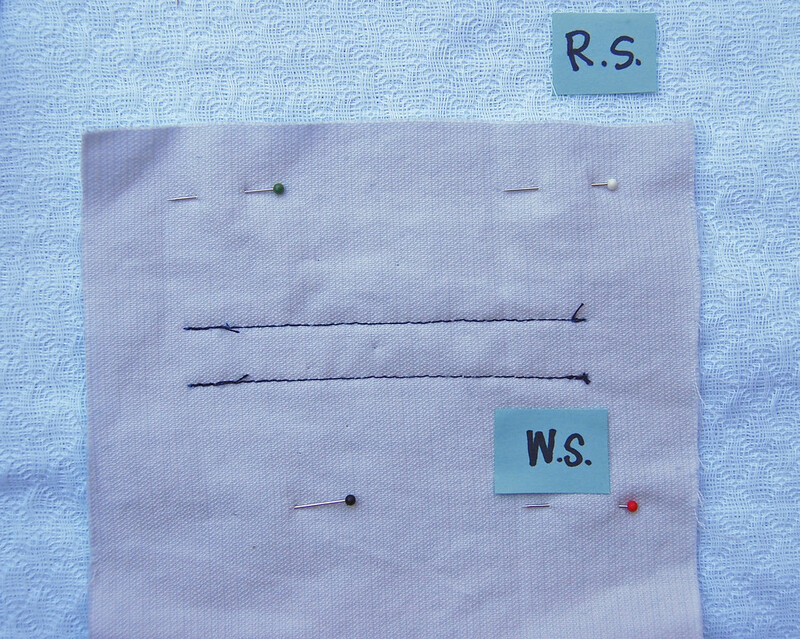 This pocket will have two identical lips, so mark the position of the midline of the welt opening - I used a pin. 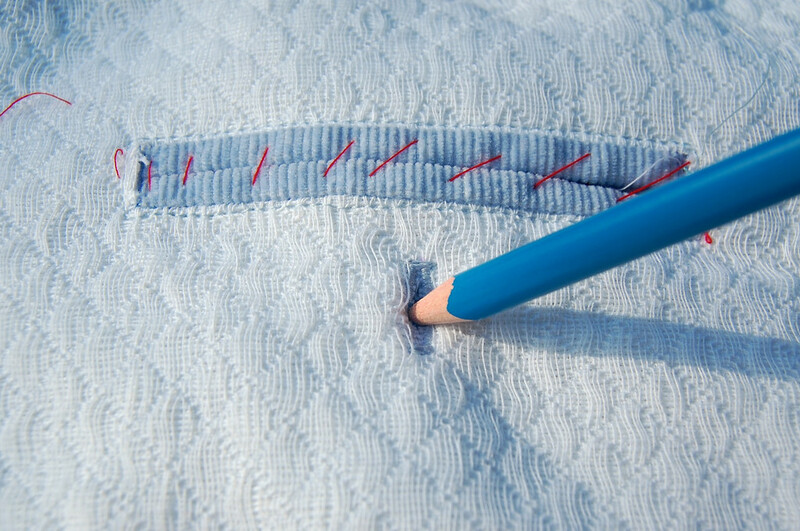 Fold up the lower section of the facing fabric to make a lip half the width of the opening, using your marker (the pin) as a guide. Repeat Step 6 with the upper section of the facing fabric. You've just made the double lips. Here is the side folded back to show what the folds look like. Baste the lips in place. 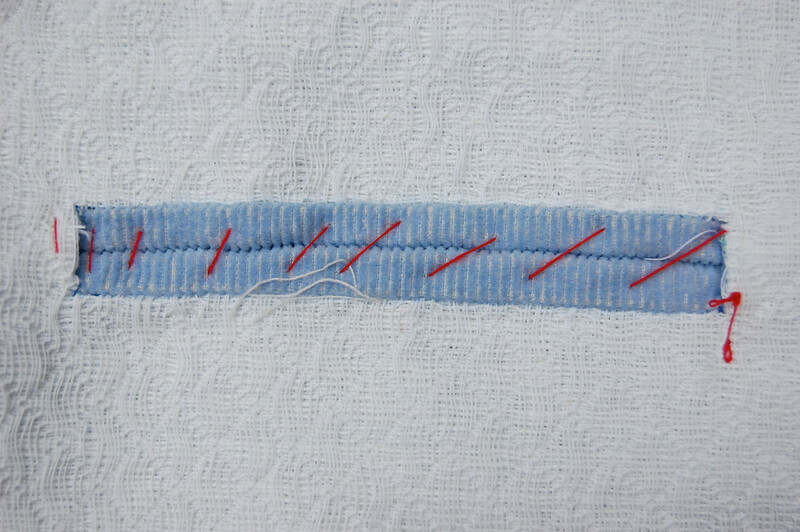 Top-stitch (or stitch-in-the-ditch) around the welt opening and add a buttonhole if you wish. Flip to the wrong side of the garment, fold up the bottom section of the facing fabric to make the pocket pouch, and pin in place. That single piece of corduroy is now the facing, the two lips AND the lining. 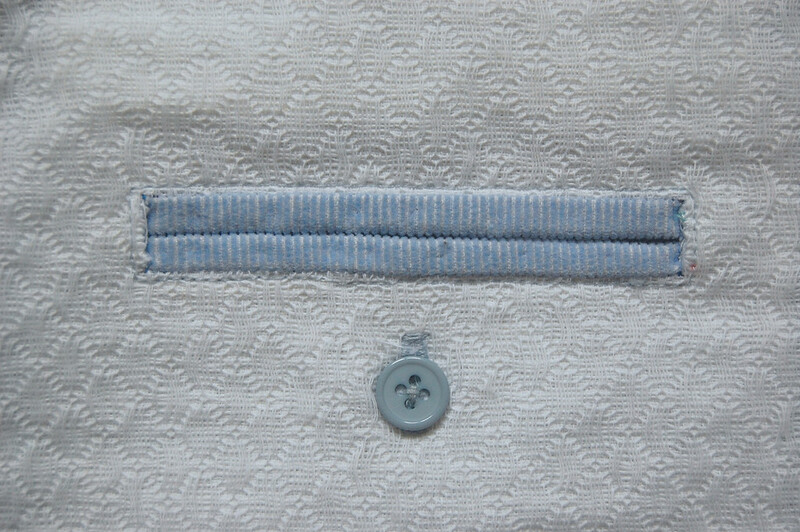 If you hadn't added the buttonhole-and-button, here's when you would just sew up the sides of the pouch to complete the pocket. But we will delay that till Step 14. Mark the position of the button on the lining behind it. 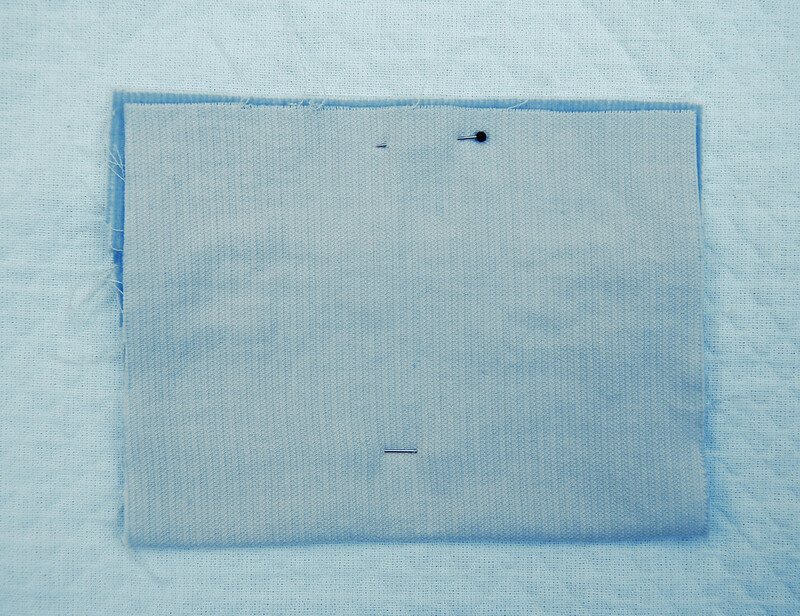 Unpin the lining/facing/lips piece and sew on the button. 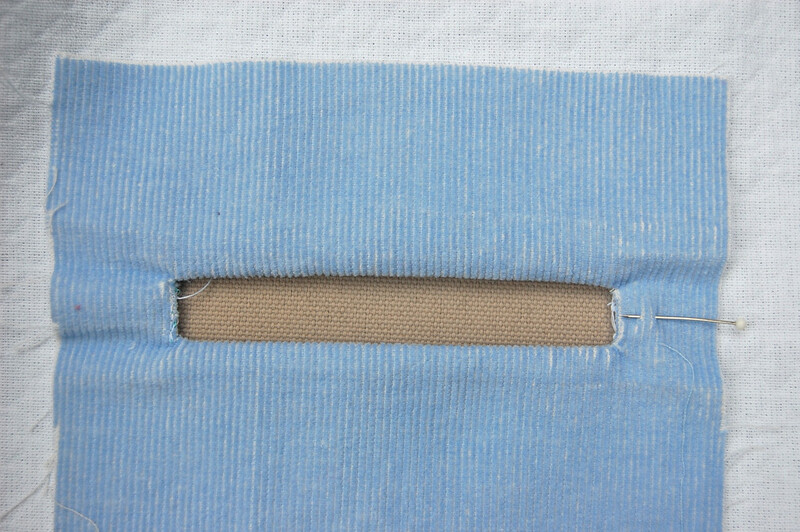 Here you can see the top-stitching around the pocket opening that keeps the lips in place, the buttonhole and the button. 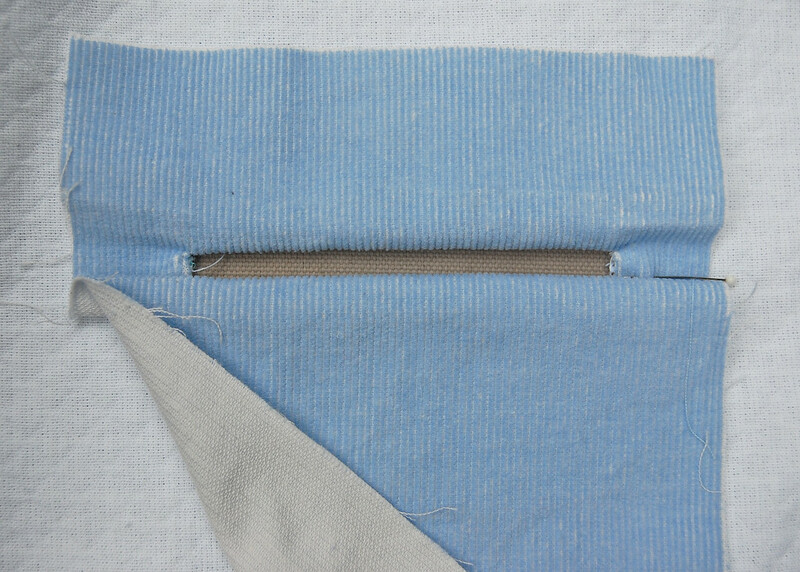 Fold the facing/lining/lips piece back up, fasten the button and pin in place as in Step 10, to make the pocket pouch. 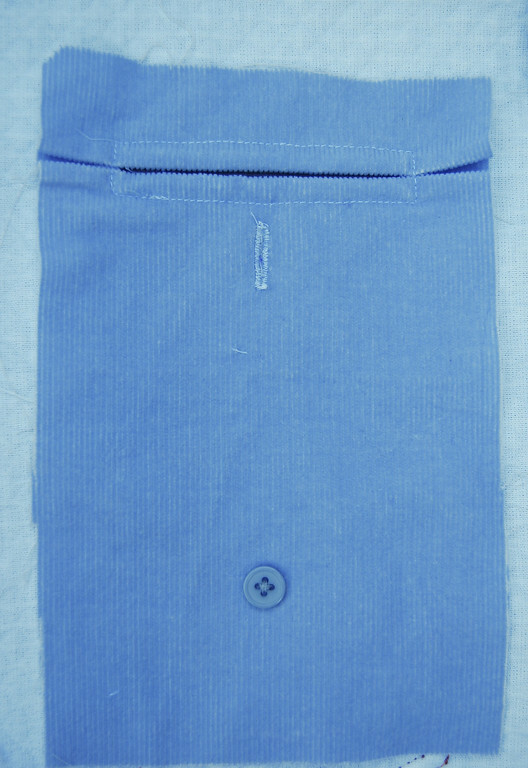 Now sew around the pocket pouch. This is the completed double bound welt pocket. 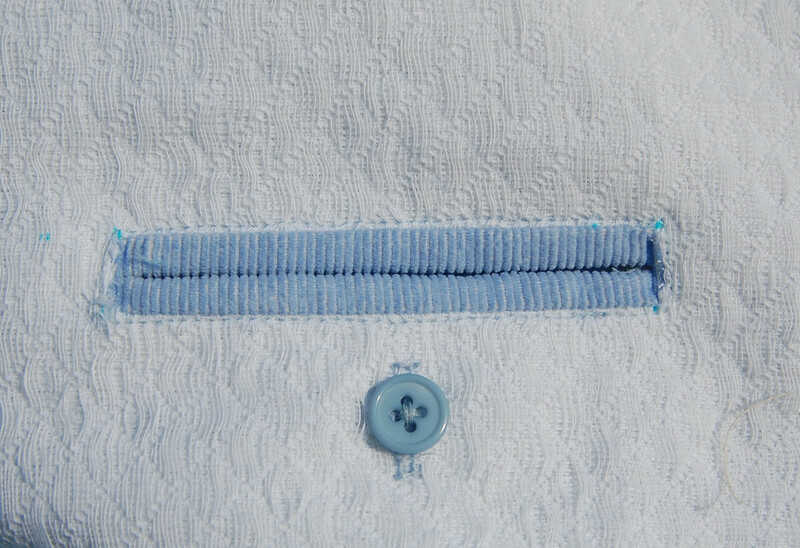 Note that buttons have been introduced in this and the single welt pocket to keep them snugly shut when not in use. 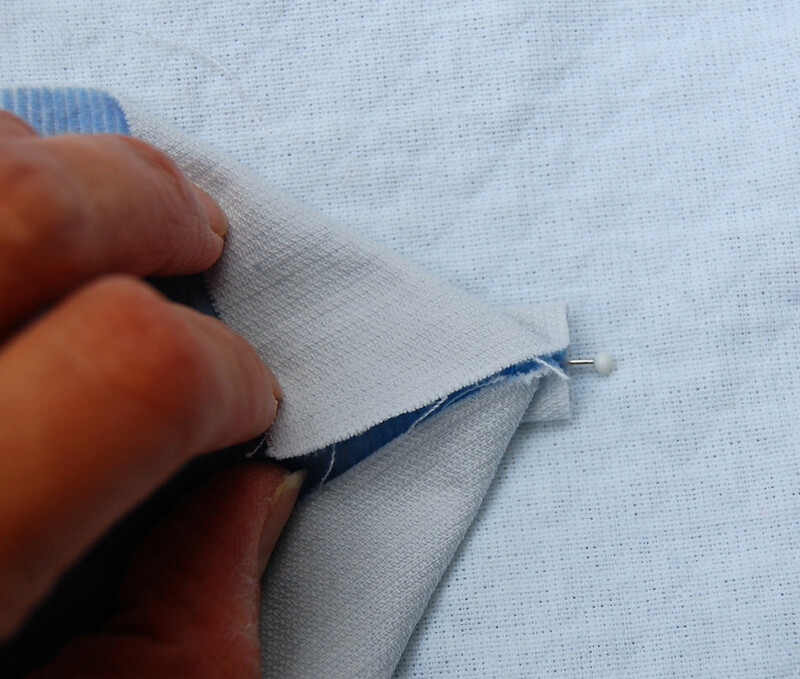 Apart from being decorative, these are also helpful for preventing gaping when interfacing has been omitted, or when they are featured in garments made of soft, unlined material. Brilliant tutorial, thx so much! 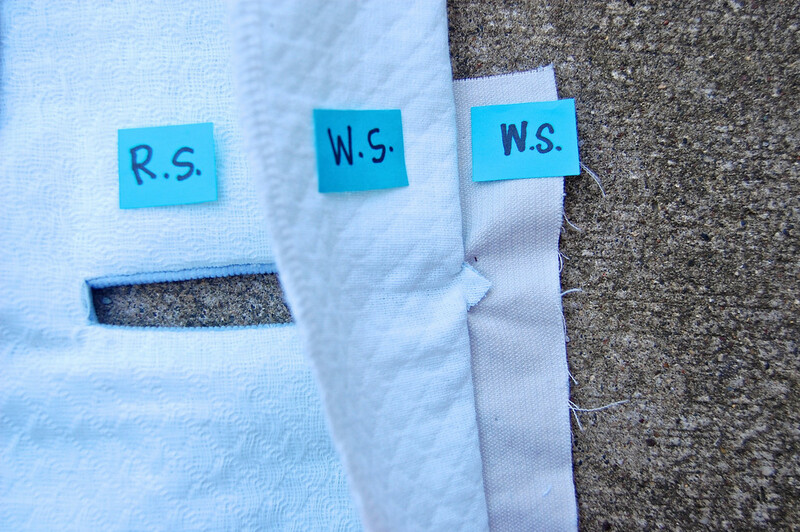 These are the simplest and most clear instructions for the double welt pockets I have ever seen, and I have been sewing for years. I have never attempted this pocket because it seemed so complicated. Thank you for this wonderful tutorial. I haven't made welt pockets since high school - I graduated in 1969! I am attempting to make my grandson a pair of golf knickers. The closest pattern I could find is a Burda for casual pants WITH the zipper but only patch pockets. 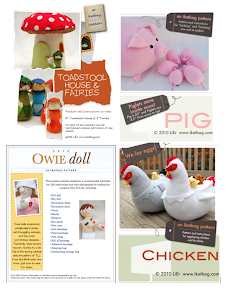 I think I can make these look professionally made with your pocket instructions. 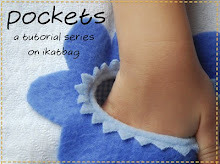 Really great instructions, I have been surfing the net trying to find out how to do welt pockets for a while, quite confused, and this really cleared things up. Thank you.